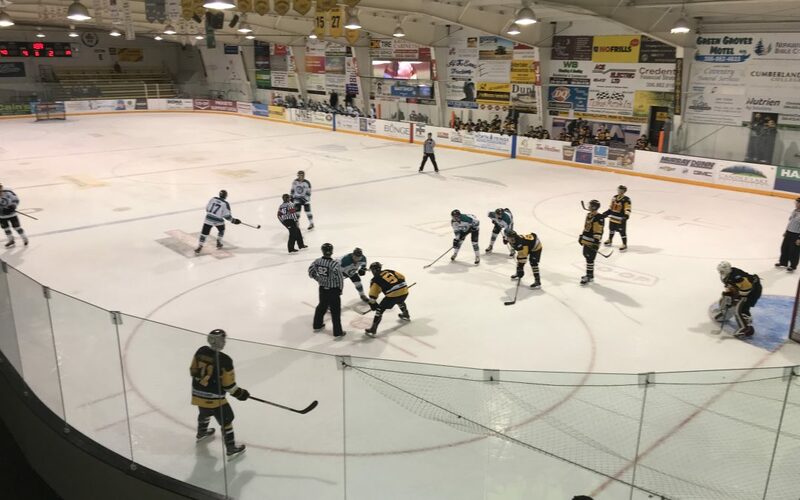 For the second time in as many nights, a slow start turned out to be the difference, as the La Ronge Ice Wolves dropped a 4-3 decision in Nipawin on Saturday evening. The Hawks jumped out to an early 1-0 lead when Brodie Girod rifled home his 11th of the season past Brendan Benoit, who turned away 36 shots in a losing cause. Nipawin went up 2-0 3:29 into the game on the power play when Jack Lenchyshyn tallied his first of the campaign. La Ronge was outshot 15-3 through 20 minutes of play, but responded in a big way in the second. The Ice Wolves cut the lead to one just 55 seconds into the second when Daunte Fortner found Jake Gudjonson, who whistled the puck upstairs past Patrick Pugliese, who ended his evening with 17 stops. La Ronge tied the game at two 5:21 into the frame when Zach Bannister made a sweet pass to Jordan Mish, who slipped home his 11th of the season. Nipawin pulled ahead 3-2 17:45 into the second when Michael Makarenko scored his fifth of the season on a goalmouth scramble. The Hawks added some insurance 5:24 into the third when Makarenko netted his second of the evening. With under a minute left, the Ice Wolves found themselves on the man advantage and Antonio Di Paolo made things interesting when he blasted home his 12th of the season from the point, but that’s all the offence the Ice Wolves would get, as the Hawks recorded their fourth straight win. La Ronge forward Zach Bannister extended his point streak to four games with two assists Saturday. Bannister now has 59 points in 49 games this season. Meantime, Ice Wolves defenceman Grant Longtin recorded an assist for the second straight night. With the loss, the Ice Wolves slipped to 10-39-1-1 on the season, which has them in last in the overall standings. La Ronge has been eliminated from playoff contention. This marks the third straight year the Ice Wolves won’t be taking part in the post-season. La Ronge will look to end an 11-game losing streak next Friday night when former Ice Wolf Mitch Zambon and the Humboldt Broncos come to town for a 7:30 p.m. puck drop. Those two teams will also meet on Saturday at the Mel Hegland Uniplex.